How often will Walls.io refresh content on my social wall? By connecting your accounts, you're granting Walls.io the privilege to access the APIs of Twitter, Facebook, etc. through your access token. We need this access to update your social wall with as short update intervals as possible! Which social media accounts do I have to connect? You can basically use any social media account you're permitted to use! 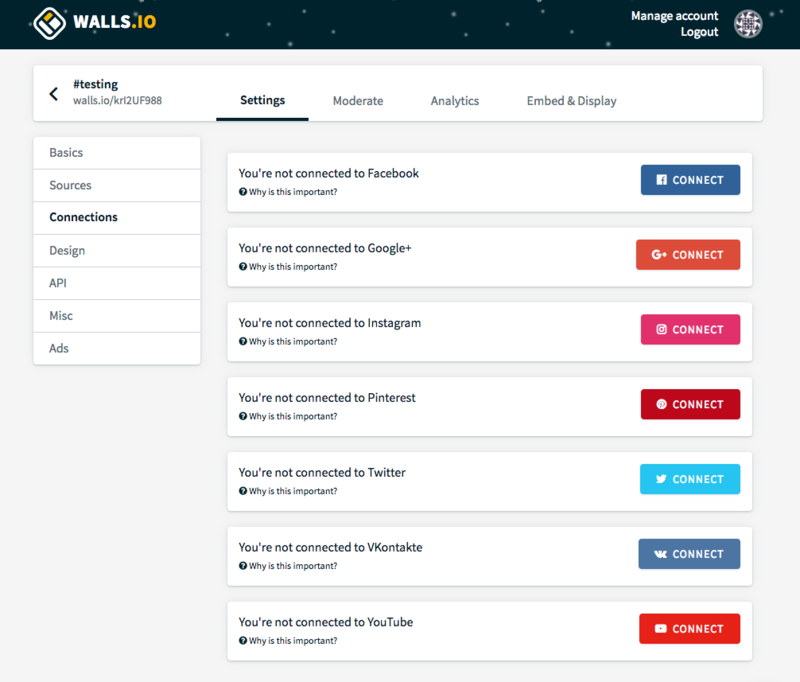 Walls.io won't display content from these accounts, we'll just use them in the background to access the APIs! This means you can also use your private accounts. What are the actual update intervals for Pro & Premium Walls? For Twitter, we're updating your social wall in real time! For all other platforms, your wall receives up to 1 update per minute! What are the actual update intervals for Free Walls? For all other platforms, your Free wall receives up to 1 update per 15 minutes on average, no matter what platform! Please notice: update intervals will automatically decrease on walls that use a very large number of sources, f.e. more than 10 Facebook Pages, etc. We'll also decrease the interval for sources that deliver fresh content only once in a while, f.e. if a hashtag is relatively low-traffic.